Bob DuBert spent a day at the Gale Family Library in St. Paul last Saturday, going through two boxes of NWA corporate archives researching a future article for the NWAHC newsletter, Reflections. He discovered these aerial photos in a signed album dated 1983 by the late Arthur Gibson who, Bob says, "was a close friend of Bryan Moon and a man who was considered to be the best British aviation photographer ever. If you want to check them out in person, here's the call number that you would submit at the Gale Family Library: 147.G.14.1B Box 14." Bob contacted Bryan Moon (subject of Spring 2013 Reflections cover story) about what he found and here is Bryan's reply: "Arthur Gibson was by far the best aviation photographer ever. I flew with him many times. He was a perfectionist and my best friend. . .the NWA pictures were commissioned by me. In those days, when a 747 or DC10 was scheduled for delivery, I chartered a chase plane for Arthur to work his photo magic. I was in the NWA aircraft at the time and his pictures were used in NWA advertising for years. Sadly he died organizing a British Airshow and I was at his funeral service. 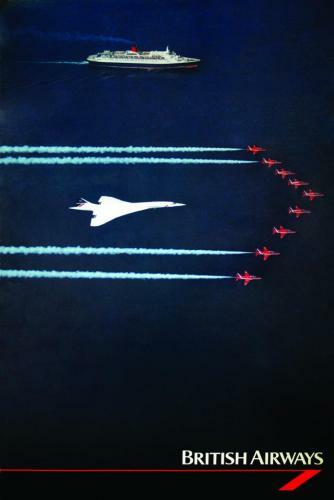 Gibson was closely associated with the Red Arrows aerial acrobatic team, and shot the photo below which became a poster for British Airways. Lady Skywriter especially loves it because she has traveled across the Atlantic on both the QE2 and the BA Concorde. Darn it, never got into a Red Arrows airplane, though.